Yuvraj Singh smashed an entertaining century while Wasim Jaffer missed his one slightly on the fourth and final day’s play of the President’s XI and Australians match at Hyderabad. The match ended in a draw with the Australian Skipper Ricky Ponting scoring an unbeaten 58 (from 97 balls with 7 fours and 2 sixes) along with Michael Clarke (who made an unbeaten 36 from 70 balls with 5 fours) to secure the stalemate. Now all the action shifts to Bangalore where the first Test of the Border-Gavaskar Trophy begins from the 9th. There was an opportunity for the Board’s team to force a win through a declaration early this morning. But Yuvraj Singh decided against it and used the time to give a real punishment to the Australian bowlers with his blistering strokeplay. Wasim Jaffer kept his end with a lot of care before Stuart Clark found some reverse swing going in his favour to dismiss both the batsmen. First to go was Yuvraj who nicked one behind in an attempted expansive drive and Jaffer had no clue to a big reversing inswinger. Yuvraj Singh struck 7 fours and 7 sixes in his knock of 113 which came in 143 balls. Jaffer scored 93 through 12 fours facing 159 balls. The pair of Jaffer and Yuvraj put on 200 runs for the 3rd wicket. Yuvraj declared the innings after 70 overs to give an unrealistic target of 434 for the Aussies. First innings centurions – Rohit Sharma (29 from 39 balls with 6 fours) and Virat Kohi (16 from 33 balls with 2 fours) stayed unbeaten at the time of declaration with the Board’s team at 292 for 4. The Australian openers Katich and Hayden were dismissed cheaply when they came out to bat. Katich played a loose cut shot off Gony and Hayden got lbw to leggie Piyush Chawla. 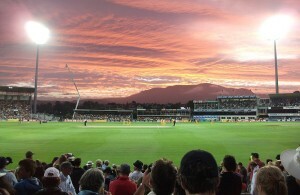 The remaining part of the match was seen through by Ricky Ponting and Michael Clarke.